Besides, if I went with that theory, I'd never eat another vegetable, because The Cajun would be happy with a platter full of meat and zero veggies for the rest of his life! Well, I love vegetables, so I don't deny myself things like greens and cabbage just because he doesn't eat them. We usually have leftovers of something else he does love hanging around in the fridge, so he's covered anyway. And, of course, there's always sandwich meat. What we call "fried cabbage" in the south, is my most favorite way to eat it, and, actually every time I buy a head thinking I'll cook something different to share on the blog, I end up using it for a pot of fried cabbage instead. What can I say? I just love the stuff! Course, fried cabbage isn't really "fried" at all, rather it's stewed down, more of a method that we call "smothered" down here in the Deep South. This time we're tossing in some potatoes, onion and spicy andouille sausage to round it out. I bought a head of cabbage this time that was large enough that I was able to stretch it over a few recipes, making my stir fried cabbage with beef, with enough left after this dish to make a small pot of my favorite fried cabbage. Cabbage heaven, I tell ya! Here's how I prepare this one. After carefully halving, I just cut a wedge out to get rid of the core. It's pretty tough, so be careful when doing this. I also like to cut the cabbage into fairly large chunks. You'll want about 9 cups chopped. For the potatoes, I like to use the red-skinned ones because the skins are tender enough not to have to peel, though you can use a good sturdy russet too. Cut the potatoes into a large dice too. I always toss my potatoes into water until I'm ready to use them to keep them from browning. Heat 2 tablespoons of fat in a large pot. You can use butter, bacon drippings, cooking oil, olive oil, whatever your preference. Add a pound of sliced andouille and cook until lightly browned, about 5 minutes. Add the potatoes. Add the chopped onion at the same time and season with salt and pepper. Toss everything to coat with oil. I actually like to use Cavender's Greek seasoning when I cook cabbage. It's a great all purpose seasoning that has salt and pepper and something like 13 separate seasonings and herbs that add a lot of flavor, and is a regular pantry staple for me. Salt and pepper work just fine too of course, as does seasoning salt. Because of the potatoes in this dish, I like to smother everything in stages, adding a cup of broth along with half of the cabbage, covering the pot and cooking for about 5 minutes, before adding more broth. Together with the skins, it helps to hold the potato together so you don't have a pot of potato mush. Chicken and beef broth, and even water, will all work here, though I like the extra flavor from milder chicken broth. Stir, add in another 1/2 cup of broth and the remaining cabbage; stir, cover and cook for 10 minutes more. Add remaining broth, stir and cook uncovered, stirring often, until potatoes are tender and cabbage reaches desired consistency, 5 to 15 minutes. Add remaining 2 tablespoons of butter and the cider vinegar and red pepper flakes, if using. Toss, taste and adjust seasonings and transfer to serving platter with all of the juices. Because I was photographing my platter, I didn't pour out all of the juices for the picture. Heat 2 tablespoons of butter (or oil) in a large pot; add andouille and cook until lightly browned, about 5 minutes. Add potatoes and onion; season to taste with salt and pepper and toss to coat. Add 1 cup of the broth and half of the cabbage. Cover and cook over medium for 5 minutes. Stir, add 1/2 cup of broth and remaining cabbage; stir, cover and cook 10 minutes. Add remaining broth, stir and cook uncovered, gently stirring often, until potatoes are tender and cabbage reaches desired consistency, 5 to 15 minutes. Add remaining 2 tablespoons of butter, cider vinegar and red pepper flakes, if using. Toss, taste and adjust seasonings and transfer to serving platter with the juices. Cook's Notes: Andouille sausage is a highly spiced smoked sausage that is blended with Cajun spices, adding a spicy kick and great flavor. Some brands are spicier than others. You may certainly substitute kielbasa or other milder smoked sausage, simply taste and adjust other seasonings. Substitute 2 cups of chopped, smoked ham for the sausage, or 6 slices of bacon, sliced then cooked. You may substitute bacon drippings, olive oil or other fat for the browning, but use butter to finish. In place of salt and pepper, I like to use Cavender’s Greek seasoning. While I like it okay, we rarely eat cooked cabbage but this sounds like a dish I could really enjoy. It's very good Larry! I think that's probably a texture thing for you. A lot of folks like it cooked to near mush but cabbage can easily be cooked to the texture you prefer - with a nice tooth feel or super soft. It's a personal preference really, though I love it anyway! Anything cabbage is alright with me. Can't wait to try it. I know the feeling - hope you enjoy it!! 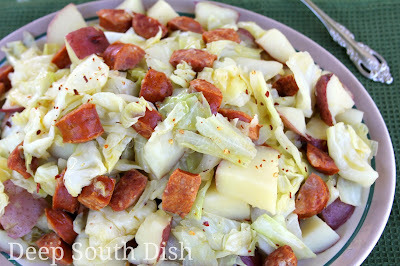 We love cabbage and smoked sausage so this is a must try! Yum! I love your Cajun Cabbage Stew....so much that I made it for dinner one night last week and woke up in the middle of the night thinking about it, LOL. I am looking forward to making this one since it's similar. Thank you! Totally understand that middle of the night craving thing for sure! Made it this weekend with polish sausage - excellent! The vinegar and butter - brilliant. DH and I loved it and I have leftovers for work lunch. Thanks for a great one. You're very welcome Peggy - thanks so much for letting me know you enjoyed it!! I sprang this on Huz tonight. I've been in the hospital and am still on liquids only, but there was cabbage that needed eating and Huz who needed feeding. I skipped the andouille and served along with pork chops, skipping the vinegat because I wanted to see how it would go over with just the bacon, onion, and cabbage. It was a hit, and it made me feel good to make him a nice dinner since he's been taking such good care of me! Aw, that's the sweetest thing ever Nancy!! I'm so glad to hear it was a hit!